Signature Flight Support unveiled its new $15 million FBO facility this week at Nashville International Airport. Included in the project was a new executive/sports charter terminal and a 12th hangar, which brings the location up to 138,000 sq ft of storage space. 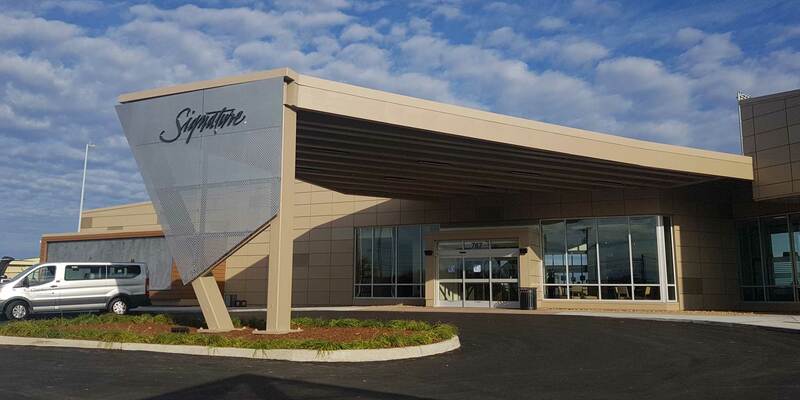 Signature Flight Support has opened a new $15 million FBO facility at Nashville International Airport, the result of a new 30-year lease from the Metropolitan Nashville Airport Authority. It features an 8,000-sq-ft terminal, which will serve both private aviation and sports charter flights. Honoring the city’s rich music history, the interior is furnished with artifacts from musicians and celebrities who have passed through Signature’s previous location at the airport, while the sports charter area pays homage to the city’s professional and collegiate sports teams. Included in the project was a 25,000-sq-ft hangar, which can accommodate the latest big business jets and brings the facility up to 138,000 sq ft of aircraft storage space. An additional 16,000-sq-ft hangar is planned. Over the next year, the BBA Aviation subsidiary will renovate the FBO’s former 4,000-sq-ft terminal, which will be used as office space for the company and its tenants.